1919 whole telegraph order, franked with. Hungarian. stamps Mi.201, 215, German - Czech blank form !, CDS Nagy Tapolcsány (Velké Topolčiany) 919 JAN.16, whole cut, very folded, after all rare. 1918 2 pcs of larger parts of dispatch-note, richly franked Austrian. stamps, i.a. Mi.219 4x, CDS Oderberg/Bogumin 27.12.18 and CDS Dobrowa 27.XII.18. 1918 Ex letter, franked with. Austrian. stamp. Mi.2x194, stamps mounted on reverse, CDS Brno, 31.XII.1918, envelope open from 3 sides. 1918 postcard franked with. Austrian. stamps Mi.222, 234 2x, sent Ex, Us pneumatic tube. post, CDS Blatná 22.XI.18, arrival postmark. Prague TGF, 24.XI.18, postmark badly readable, to examination. 1918 front side court Reg letter, uprated by. Austrian postage-due. stamp. Mi.50, thin/light CDS Louny, 30.XI.18, arrival Prague 1.XII.18, folded. 1918 Reg letter franked by complete set forerunner Hungarian. stamp. Charles and Zita, Mi.213-18, CDS Pozsony 918 Dec.15., addressed to to Budapest, good condition. 1918 court R-obsílka, where fee was/were paid mixed franking forerunner Austrian stamp. small and Big numbers 5 + 10h, Mi.P47, P38, CDS Strážnice 12.XII.18. Envelope cut and with small tearing in R margin Mercure 3150CZK. 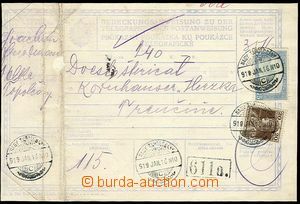 1918 parcel dispatch card segment with halving Austrian. postage-due. stmp Mi.50, CDS Klösterle a.d. Eger (Klášterec n./O.) 2.XII.18. 1918 larger part post. dispatch-note franked with. Austrian. stamps Mi.200 and 222, on reverse stamp. Mi.186 with hand-made transcription Porto, CDS Pardubitz/Pardubice 9.12.18, on reverse CDS Bruch in Bohemia 13.XII.18. 1918-19 comp. 7 pcs of skartovacích cuts from franked with. telegrams with high frankaturami(!) Hungarian. stamp. Reaper, Parliament, Charles, all with CDS Ungvár December 1918 to February 1919, interesting. 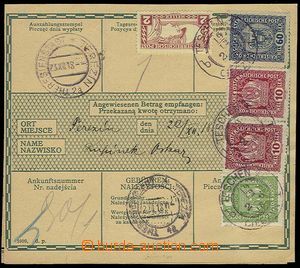 1919 2 pcs of cut-squares from dispatch-note and order, with mixed franking Czechosl. and Austrian. stamps, 1x 10h Hradčany + 60h emblem, CDS Smíchov 18.II.19, 1x 20h Hradčany + 1 Koruna emblem, CDS Asch 20.II.19., mounted on black basis. 1919 colored. postcard Ústí n/L. franked with. úhlopříčně bisected stmp Charles 25h, CDS Aussig 1/ 23.I.19. Franking disallowed, burdened with postage-due and mounted bisected postage-due. stamp. 40h, CDS Prague, 24.I.19. Rare! 1919 letter to Vienna, franked Austrian. stamp. Mi.234, CDS Neustupov 24.7.19, light folded. 1919 FP card with payment cash, cancel. FRANCO, by hand 10h, CDS Unter Reichenstein (DOLNÍ REJNŠTEJN) 25.1.19. 1919 card with printings, mixed. 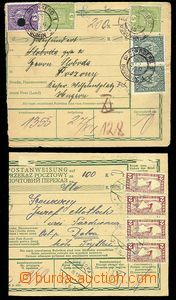 franking Hungarian. stamp. Mi.194 and Czech Pof.5, CDS Pozsony 919 JUN.21. 1919 postcard sent as FP with Hungarian. CDS Örsujfalu 19 Jan.24. with railway station mailbox pmk UJKOMÁROM. Nice print, good condition. 1919 R railway sheet with mixed franking Pof.3 + Austrian. stamp. Mi.222 2x, provisional written R, CDS Kaplitz/Kaplice 22.2.19. 1919 folded transport sheet, franked with. halving Austrian. stamp. Mi.194, broken out cancel Neratovice 12.II.19, nice. 1919 heavier Reg letter to Vienna, by hand written Reg and Barfranco 50h, CDS Bodenbach 14.II.19. 1919 off. without franking letter sent from Polského Těšín to Czechoslovakia, CDS Teschen 1 / 23.VI.19, Us Czechosl. censorship postmark + on reverse censor stick-on label! Without damage. Rare! 1919 larger part Hungarian credit notes 2fil., with mixed franking Pof.10 + Mi.201, CDS Szakolcza (Skalica) 919 FEB.27, to examination. 1919 cut square from court document/-s with mixed. franking Austrian. stamp. Mi.194 and Czech Pof.5, postmarked arrival postmark court DOLNÍ KRÁLOVICE 2.III.1919. 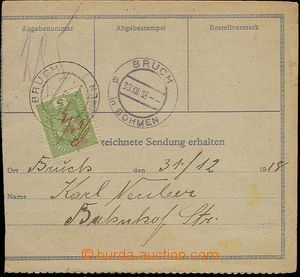 1919 to Wien (Vienna), with parallel franking Austrian. stamp. 2x 6h Crown, nationalized CDS Plzeň 3 / 21.I.19, good condition. 1920 cut square franked with. Hungarian. newspaper stamp. Mi.127, CDS Chotieschau 8.I.20 (about should be 1919), mounted on/for black basis, rare. 1918 Levecův overprint on 3 Austrian. stamp. 6, 12 and 15h, CDS Prague 2.XI.19 from favor, without addressee, Un. 5h light blue-green, block of 6 with L margin and print spike, Pof.4. block printers waste documenting horiz. 4-stamp gutter between stamp. 10h Hradčany red and Newspaper stamp Falcon in Flight (issue) 2h, total 3 x, overprinted postage-due 50h. Hradčany, printing "b" by Indian ink without numeral value, size 148 x 123mm, yellowish paper, unsigned. Pof.5, selection of, light and dark, pair on/for strong paper with two-sided print, perf. Pof.5D.